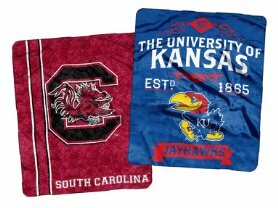 Check out these The Northwest Company NCAA 50x60 Raschel Throw $21.99 (Retail $39.99). Whether you're on the sofa or at the stadium, snuggle up in seriously spirited style with this Jersey raschel throw blanket from The Northwest Company! It's crafted with super-soft fabric and features NCAA® team colors and graphics for a look that's full of pride.